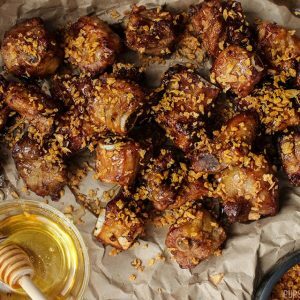 Not your traditional Chinese honey garlic ribs, these deep fried bite-sized ribs are crispy, drizzled with honey and coated in crispy garlic bits. Not for the faint of heart but definitely for the garlic lovers – breath mints anyone? My first memories of honey garlic ribs were Chinese take out nights with mom. Dad would often work late nights at the restaurant, which meant either Popeye’s fried chicken or Chinese take out for dinner. I don’t think I ever told my mom how much I loved those evenings, so mom if you’re reading this – thank you for being awesome. 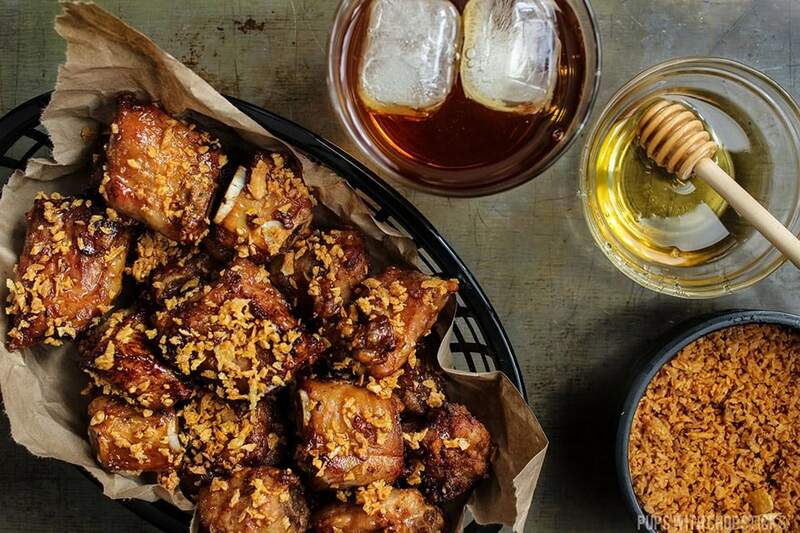 Honey garlic ribs in the 90s, were exactly the same as honey garlic ribs are now. Usually deep fried (but you could never really tell – since it was always soaking in a liquidy sweet syrup) and delicious. 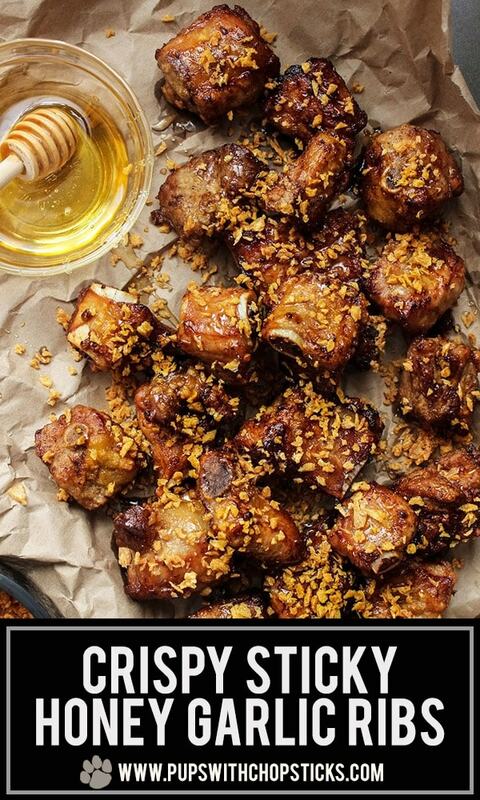 For these honey garlic ribs, all ingredients should be available at your local grocery store. For the ribs, I used side ribs (spare ribs) and asked the butcher to cut them length wise 2 inches thick. For the rice wine, this will be available at an Asian grocery store but you can also substitute white wine vinegar for it as well. The fish sauce is what makes the ribs very flavourful during the marination process. 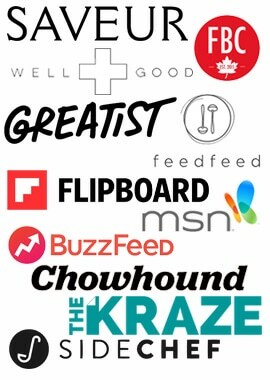 If you can find it, get it – it will last you a very long time and it’s worth it because it is filled with tons of umami-ness but please by this locally. Broken bottles of fish sauce will stink to high heaven. If you can’t get it locally, you can substitute it with soy sauce. This recipe will make a lot of crispy garlic bits so there will be extra but that’s a good thing. Save the crispy garlic to top your rice, noodles or soups! This stuff makes everything delicious. 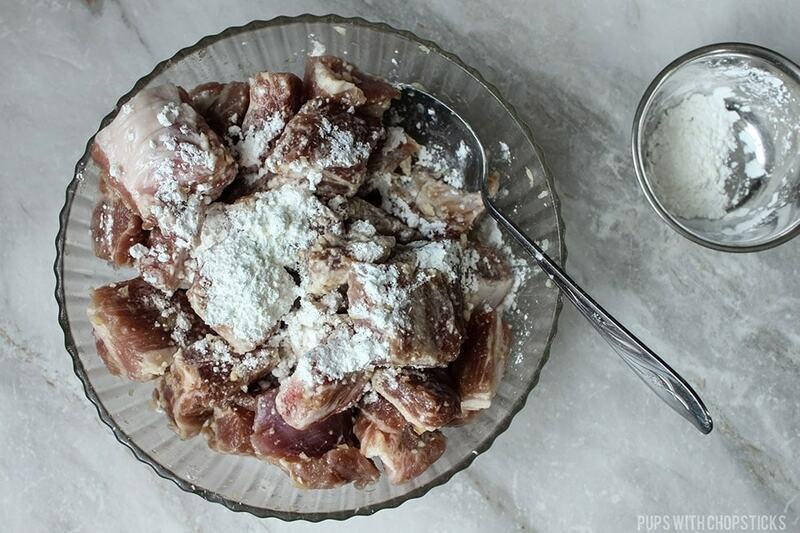 Add the fish sauce, sugar, rice vinegar and 1 tablespoon of garlic into the bowl with the ribs and mix well. Once the 2 hours is up, add the corn starch to create a thin coating on the ribs. In a high wall pot, add about 2 inches of oil and set the stove to medium heat. If you are using a deep fryer, set the temperature to 350F/177C. To test if the oil is hot, add a few bits of garlic to see if it starts to sizzle. Once the garlic is a golden yellow (This will take approximately 5 minutes of cooking. ), remove the garlic by pouring it out into a strainer or using a strainer to scoop it out. The garlic will continue to cook and brown. 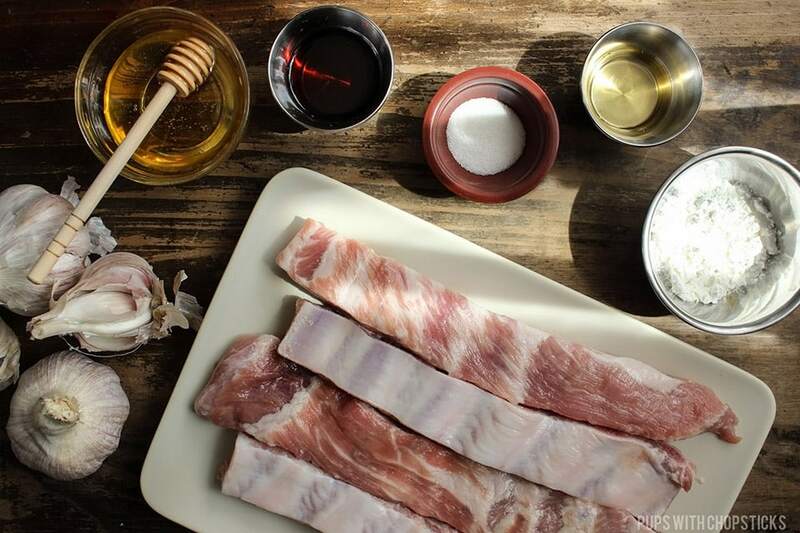 (Reserve the garlicky oil for deep frying the ribs.) Set the crispy garlic aside for later. Pour the garlicky oil back into the pot and bring it up to temperature again. 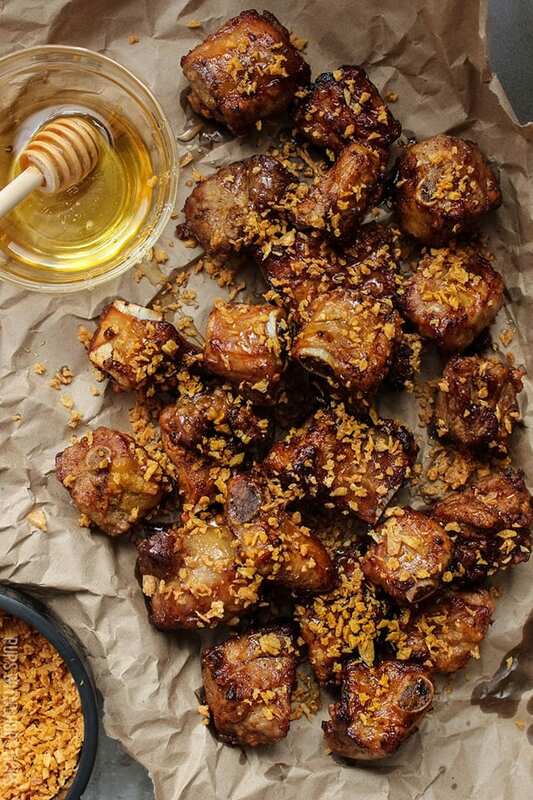 Toss it in the honey to coat it and make it sticky and then toss in the crispy garlic bits! 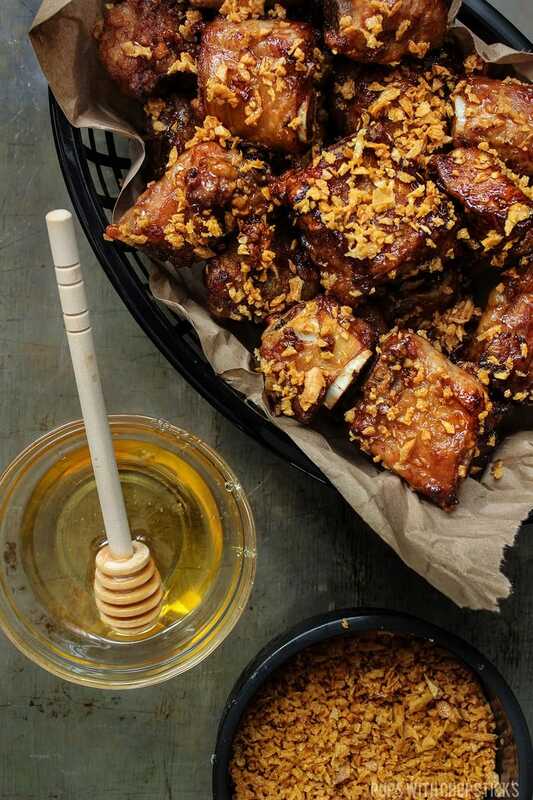 Follow us on Instagram and tag us with #pupswithchopsticks to show me all your honey garlic ribs goodness! 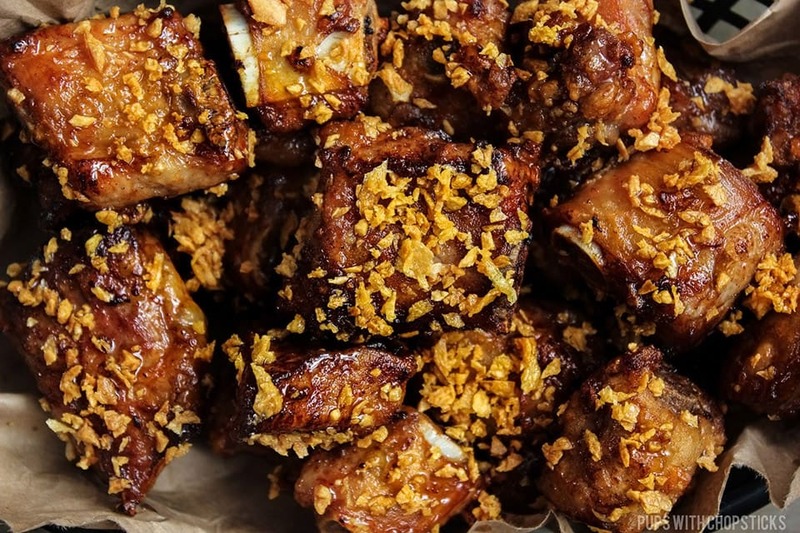 Not your traditional Chinese honey garlic ribs, these deep fried bite-sized ribs are crispy, drizzled with honey and coated in crispy garlic bits. Peel the garlic and finely mince it. (To save a bit of time, if you have a small food processor, this will work wonders) Set the garlic aside. 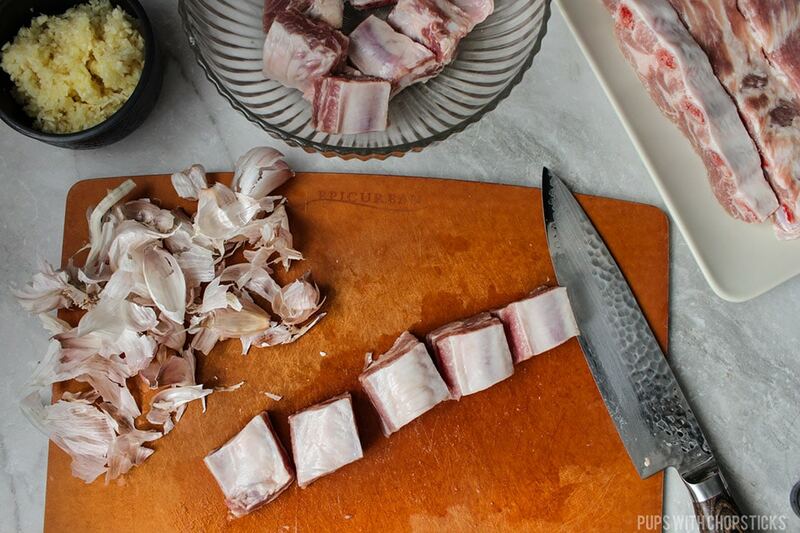 Cut between the bones of the ribs and place it in a large bowl. After 2 hours, add in the corn starch to coat the ribs, it will create a semi dry coating. Once all the ribs are done cooking, set it on some paper towel to absorb some of the grease. 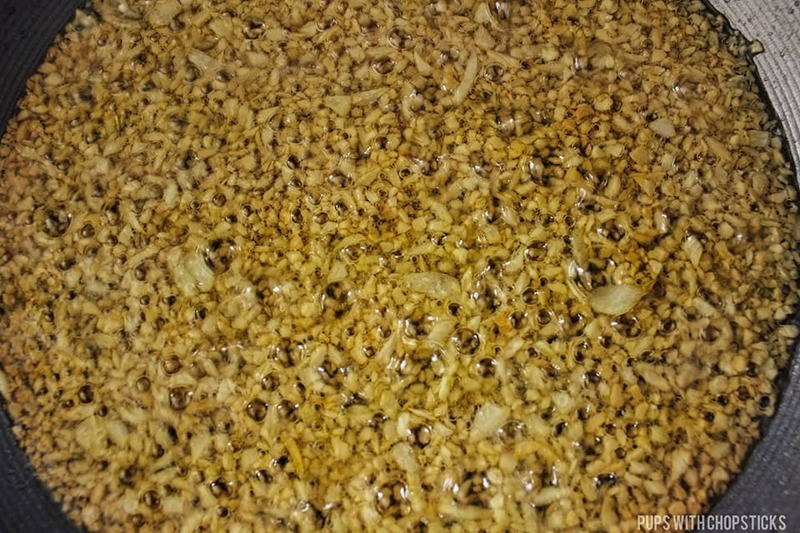 If you have extra crispy garlic bits, use them to top your rice, noodles or soups! This stuff makes everything delicious. I love spare ribs, I have tried different cookings like steaming with black bean sauce etc. 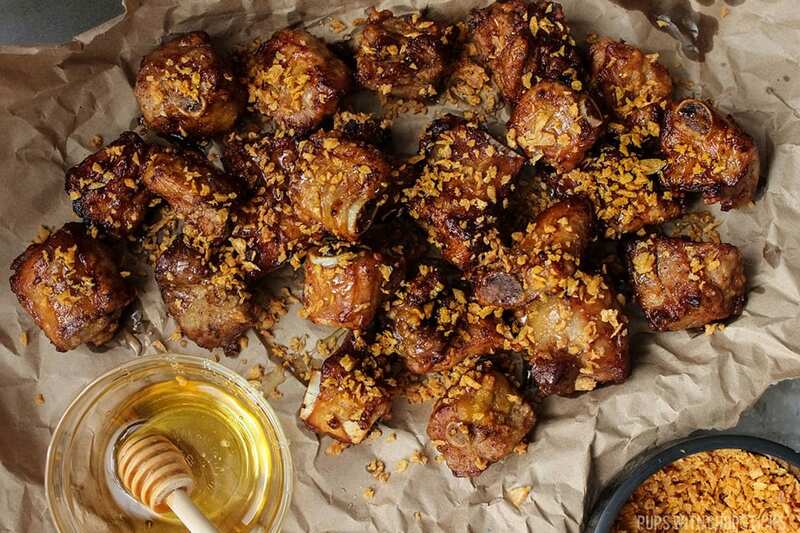 But with this honey spare ribs sprinkle with fresh deep fried garlic, I have to cook this in the weekend sharing with my spare ribs lovers to enjoy. I knew as soon as I saw that top photo that I loved this recipe (before I even read the title or even knew what it was). The texture you’ve attained on those little rib-nuggets looks 200 percent crave worthy and 400 percent delicious. That’s a lot of percents, forgive me, I am not a mathematician. haha you’re too funny and too kind! 🙂 I definitely not good at math but I am so happy to hear the results of the math equates to delicious! My favorite Chinese take-out dish is shrimp with lobster sauce, Joyce! I’d love to know the recipe so I can prepare it at home! Deep fried ribs. I love it. The garlic is like the icing on a deep fried pork flavour bomb! 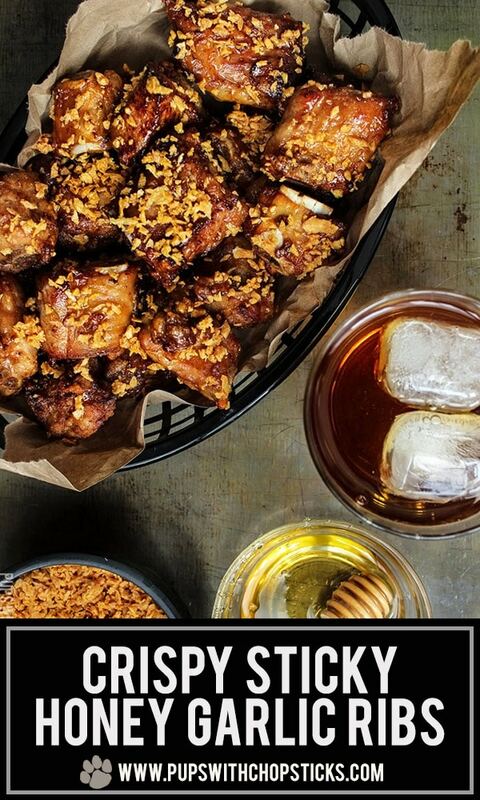 This sounds super flavorful! All the recipes I’ve made from your site have been delicious and I can’t wait to try this one! There are many foods that I too have first eaten from takeaway and then never been able to forget! Also the step by step instructions are helpful! My friend is a mega rib fan. I have just sent her this recipe as she’ll love it! You sure got a great crisp coating. Great step by step instructions too.